After a few students backed out on my Saturday dive, I reviewing the weather forecast, and checked with Roger to see if there was any room. As it turned out, they needed crew for a student dive. Life is good. My gear was already prepped and packed, just set the alarm. The morning was calm with some light clouds. The boat was quickly packed, and we were headed out in nearly flat seas. Given a group of open water students, the destination was for an inshore wreck in less than 60 ft of water. In my mind, that means more bottom time, and perhaps fluke. On the way out, I found out that only half of the group was in Open Water, and the rest were newly certified divers getting in some more practice. This became evident by the number of question about my KISS Rebreather. Not wanting to take attention away from an instructor with a class, I tried to be polite, but kept the answers short. We were quickly at our destination and Chris jumped in as I threw the hook. Within minutes he had us tied in, and we started getting everyone geared up. The students went in last as the other divers went in armed for some of the Tog this wreck is know for. By the time they were in, Chris was up with a vis report. Not good. I tried to keep a positive attitude, and rolled in with the camera. The surface was a little cloudy, but the bottom was downright dark. Vis on the bottom was 5-10 at best. I’m not familiar with this wreck, so out came the reel. I left the gun topside as light, camera, reel, and gun just seems like a bad combination. Of course, I immediately ran into some nice Tog on top of the wreck, and a fair size fluke as soon as I hit the sand. The wreck was mostly intact with some areas where you could penetrate. A quick inspection for lobster came up blank. The camera was just about useless. Some part of me was tempted to go back up and exchange it for my spear. Instead, I fell back to my age old plan of just looking around when on a wreck for the first time. Even in the tight vis, there was lots to see. In addition, it’s good to just practice using the camera controls and playing with different settings. It was good to get wet without students of my own to watch. After a complete loop around, I doubled back. I could hear some of the divers starting their second dive, so I headed back to the boat. We got the class back in the water, and Chris prepared to pull the hook. Once everyone was aboard, we were quickly free, and on our way home. Back at the dock we set to work cleaning fish and the boat. The new divers were obviously excited about the dives, and asking when they could go again. I only wish I could have gotten some pictures for them to remember the day by. After years of trying, I still have not made it to the Varanger. However this time we were close! Besides the Varanger issue, I’ve been trying to get together with some fellow instructors to schedule some student dives in the proper depth range. It’s been hit or miss over the last year, but we were finally able to coordinate schedules. Unfortunately, none of my students were available. It figures. I’ve never been on the Atlantis before, so I just headed out to check out the boat and crew, and hopefully get in some fun dives. NOAA was calling for rough seas around a front of storms coming through. The front generated a fantastic sunrise, but the old “red sky in morning” told us NOAA might be right this time. We could see the front to the south, so we headed north to out run it. This plan worked well. We never saw more than 2 ft seas, and we had a fresh water rinse for our gear on the trip home. The Atlantis is located right inside the Absecan Inlet with parking next to the AC Aquarium. She’s a large comfortable boat with lots of deck space, and room inside for passengers and dry gear. Geoff has been trying to get me down to AC to try it out. I must say, I was impressed. Shortly we arrived on the Southern Lillian. The crew had a grapnel on the wreck quickly, and Geoff jumped in to secure it. Once secure, divers started dropping in. As usual, I was helping everyone in, hoping to hear a bottom report before dragging my camera into the water. 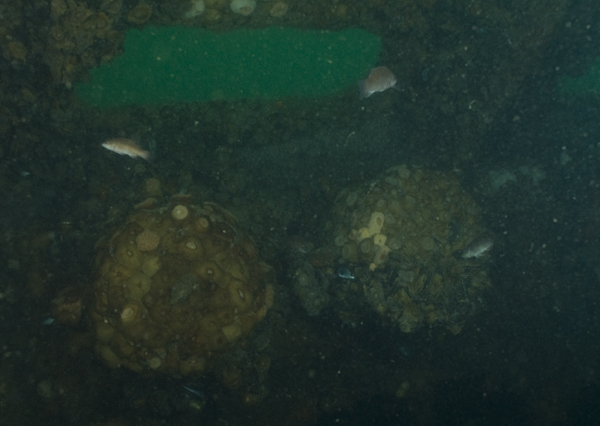 Geoff reported that below the thermocline, the clear surface water gave way to dark muddy bottom conditions. Visibility was estimated at 5 ft at best. With most fish out of season, I rolled in to look for scallops or lobster. Geoff was right, below the thermocline the temp dropped to 47, and the vis made it difficult to even read gauges. Once on the bottom I tied off and started the search. I’ve been on this wreck several times, but in the current vis, I had no idea where I was. I pulled out a few lobsters with eggs, and finally scored a couple legal ones. Most of the fish darted away from my light as it approached. There was one notable exception. Off in the distance, I could see a large white object. On closer inspection, it was one of the largest Tog I’ve ever seen. It was not intimidated by my light or me. As I approached within a few feet, it slowly swam over the top of the nearest deck plate, and disappeared. Satisfied with my catch, I headed back to the line. for some reason, there were large “clumps” of vegetation. No one was sure what it was, but in some areas of the wreck it was piled up like tumbleweeds. Reeling up the line involved pulling out wads of this stuff. The thermocline at 70 ft felt great, and I could immediately see the boat, and the fact that it was raining. Most divers went in for a second dive. I opted for one long dive, and was happy with the harvest it produced. Many of us slept on the trip home. There are six bunks below, and lots of space inside to stretch out. Our wet gear got a fresh water rinse on the way, and we still made it back to watch the rest of the game. It was not the Varanger, but it was still a fun day of diving.